A Slice of Summer!! !Chose this yellow watermelon at the local produce stand yesterday, just on a lark. It was just for fun and had two strikes against it to start with- it was very small and not seedless. Hey, I have two teen boys, a daughter and Steve and watermelon is my personal fave, so they usually need to be pretty big!And seeds- well, we've just gotten spoiled with the seedless varieties. But OMGosh! This watermelon was sooooo sweet and wonderful!!!! Probably sweeter than any red I've ever had! It was WONDERFUL! ANd the color was just so pretty on the plates. 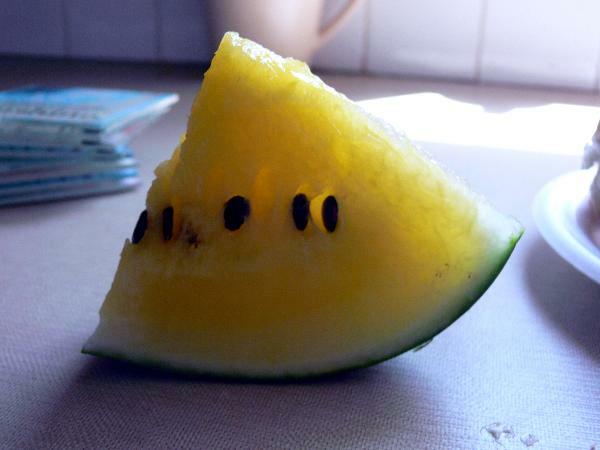 So if you get the chance to try a yellow watermelon, don't pass it up! I'm not a watermelon fan at all (ICK! ), but this sure looks pretty! Watermelons! My mouth waters at just the thought. And yellows are so incredibly sweet. Enjoy! And that's a great picture!! I added you to my blogroll. hope that's ok. I LOVE your blog! So glad you added it to the end of your email! Check out mine someday. I doubt they have that here... but now I am definitely going to have to look!!!! That is just wrong!! But I do want to try it. I will look for it. Thanks for blogging about it. I would have never of known it exsisted. It's delicious HUH!? I had some this summer for the first time too and after my eyes quit telling my tummy to expect pineapple I couldn't get enough!